So I mentioned on my last blog post about how I've been getting back to basics and loving it. I don't know what the catalyst was but I no longer want a complicated wardrobe where I have to match things up or create outfits..call me lazy! Instead, I've stripped my wardrobe right back to a basic (mostly) neutral palate, where patterns are no longer playing a part and my day to day dressing decisions are so much easier now! I'm just adding in a few statement coats for interest. Why didn't I think of this sooner? I think because I blog, I thought this kind of wardrobe would be a disaster...that I'd have you all falling asleep but then I thought, is this not the holy grail of the busy mum? The capsule that works perfectly together, makes each day a doddle to dress for and has the bonus of making you look effortlessly stylish all the time. Because that's what clean, structured basics do. When I browse Pinterest or look at friends who's style I admire, that's the common theme. Simplicity, clean lines and mostly neutral colours. I'll cover off bottom half, coats and accessories on future posts but for today, here is a selection of the tops I've recently sourced for my new wardrobe. 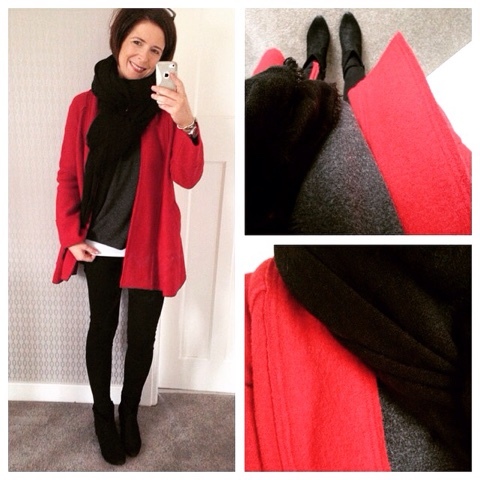 Amazing, basic, quality pieces that have slotted in perfectly with the rest of my clothes. First up, these jersey tops from River Island are fab. As soon as I felt them in the shop, I HAD to have one. They feel like cashmere - super soft. I bought the dark grey one first and wore it for the first time in Boston. The shape is really flattering and they're very cosy so I've been back since to buy the black one. There has been a little bit of bobbling on the grey one but it's not that noticeable and I love it too much to get annoyed about it. It washes well (and tumble dries) too. The dark grey isn't on the link above but it's on this link here - inexplicably called the 'Dark Grey Super-Soft Hanky Hem Top'! I've bought the 12 in both of mine. 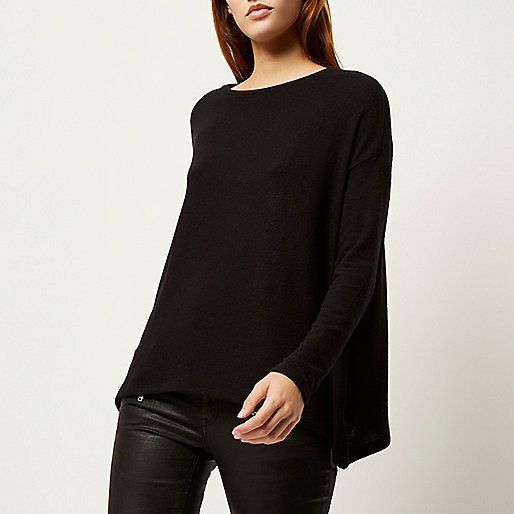 This draped asymmetric top is also River Island and is a bit more interesting shape-wise. It's called grey but it's more like a khaki colour in real life. 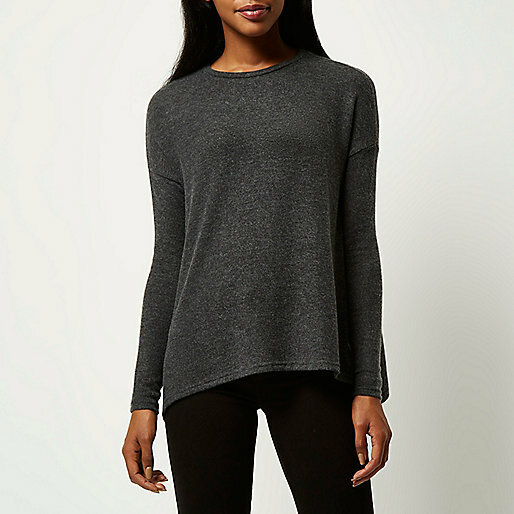 It does also comes in a charcoal grey, which I've only seen in-store...not online and black also - on this link. This top has a bit more potential to cling so I bought the size 14. Next up, I saw this Topshop top on my friend Helen (in cream) and went straight into town the next day to buy the black version. It's just a gorgeous shape and I like that it's a bit shorter than many of my tops, but is still flattering with the sleeve fluting and the split hem details on the sides. This has also washed really well and only needs a lick of the iron before wearing again. Every season, I look for a few long sleeved jersey tops and this year, I've found these ones from M&S. At just £8, they're perfect, wash well and keep their shape. They're also a nice length as so many jersey tops are too short on my torso. Finally, I found a brand called Cable & Gauge at TK Maxx and if you're in your local store, check them out as the cotton is lovely and soft and they're really well priced. 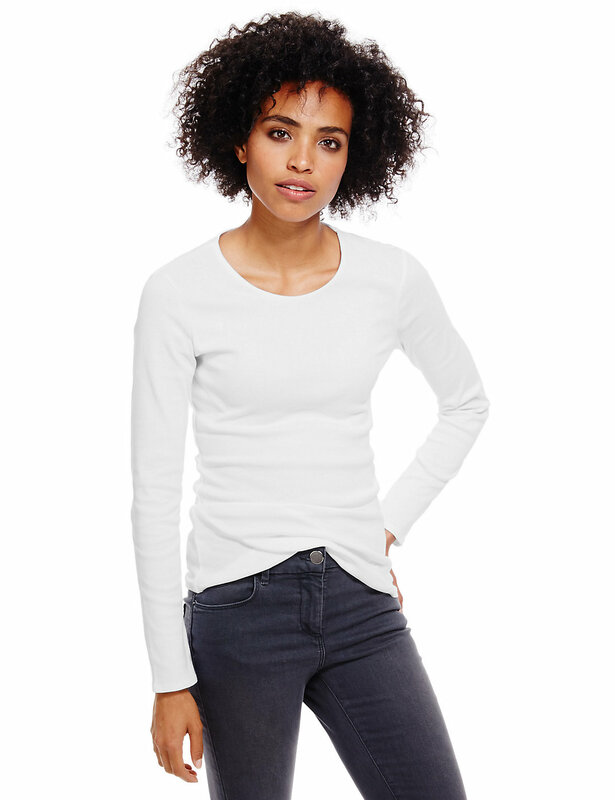 I think it's a US store and some of the range online is horrific but I've bought a couple of great basic cotton tops a bit like this one and they're lovely and soft. Finishing with a couple of outfits from Instagram (where I am most active!). I know it's been a bit quiet on here the last couple of weeks but I've not stopped blogging permanently I promise and thanks to all of you who've been in touch to enquire. It's just been a bit busy and I felt like having a break so I could focus on some other stuff. 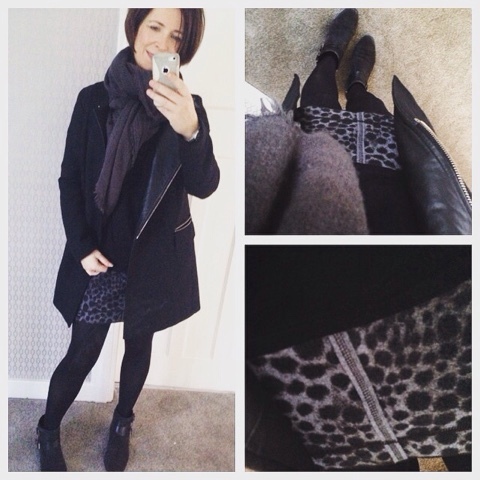 Back with a bang and inspired by my leopard skirt below, I've a great post about statement skirts coming up. I agree, personally I always feel a little smarter and more chic in neutral colours and simple outfits. It's easier then to add interest with fabric and accessories!